Born in Ethiopia and adopted to Swedish parents, Marcus Samuelsson has probably the most interesting and intriguing human-interest stories of anyone in the food world. But his story is not what rocketed him to the top of the food world, it was his talent. When a devastating cut from the soccer team he loved caused him to question his purpose in life, fatefully and blessedly, Marcus thought back to the love of his grandmother's Sunday dinners and decided to consider a career in food. Marcus was curious and passionate. He had the desire the learn about traditional mother cuisines, but what really helped him stake his claim in the world of his food was his desire to play with flavors and textures that defy tradition. This book has everything I love about a food memoir: passion, heart, drama, and mouth-watering descriptions. Samuelsson holds nothing back about his life: he discusses his own issues with race, the child he abandoned, and even talks smack about other chefs, namely Gordon Ramsay who, according to Samuelsson, is just as mean (and also bigoted) as he appears to be on his TV shows. I loved this memoir and I adored listening to Samuelsson narrate his own auidobook -- I could listen to him talk ALL DAY. But I'm not gonna lie, I'm dubious as to whether he wrote this book himself. Any time a celebrity writes a book, I have to suspect that it was written by a ghost writer. The same holds true for Yes, Chef. Does that make his story any less important to read or less entertaining? No, not at all. But the dirty little secret of celebrities hiring ghost writers to tell their stories always leaves me wondering what percentage of them actually write the books that bear their names. My guess is that percentage is not very high and my gut suspicion is that Samuelsson gave a rough outline of his story to the person he or his publisher hired to write his story and then went off to judge an episode of Chopped. Still, after listening to this audiobook, I have a great respect for Samuelsson as a chef and am now determined to eat at one of his restaurants the next time I'm in New York or Chicago. His passion for food mimics my own: finding ways to honor traditional cuisine while amping up flavors and textures in new and unusual ways. Of course, Samuelsson's passion and talent is obviously much more legit and disciplined than my own: he's a professional chef and I'm just some schmo who likes to cook and eat. 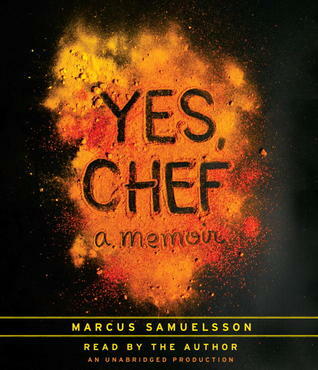 If you like food memoirs or are a Food Network junkie like me, I highly recommend reading or listening to Yes, Chef. Though if you're also like me and love listening to Marcus Samuelsson talk, choose the audiobook over the hardcover. Check out my review of Marcus's cookbook, The Soul of a New Cuisine. This has been on my list since it came out. I really need to read or listen to it ... like soon! Most celebrities get help with their memoirs: they work very closely with an editor, have a ghost writer, or get other assistance. That doesn't make it less of their own story, though. I hadn't heard of this one, but do enjoy foodie memoirs. Will look into Yes, Chef... thanks. I've had this memoir on my radar for quite some time. I think my library has just gotten in recently, so I have no excuse not to give it a go. I've heard positive things about this book from so many people - it sounds good (though I too wonder who 'actually' wrote it). Glad you enjoyed it! I must look out this book. It went on my tbr file after the last Books You loved edition and now I want the audio version! Have a great weekend. I'm sure a lot of people have ghost writers. If I recall there was a story on a news show about the people behind the scenes , they don't get much credit. But it does sound like a good read and a good story.